› Author Affiliations Funding National Natural Science Foundation of China (NSFC): 71742005 and 71731009. Background: Radiotherapy has serious side effects and thus requires prudent and cautious evaluation. 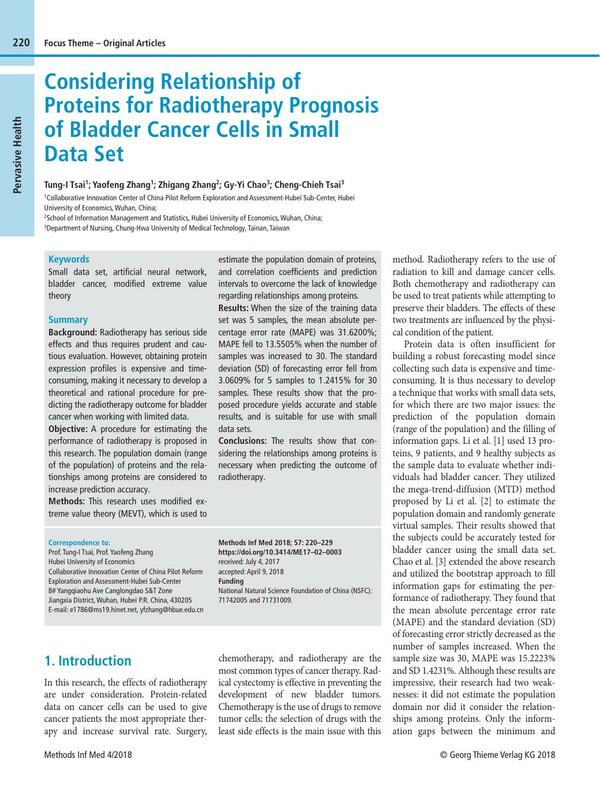 However, obtaining protein expression profiles is expensive and timeconsuming, making it necessary to develop a theoretical and rational procedure for predicting the radiotherapy outcome for bladder cancer when working with limited data. Objective: A procedure for estimating the performance of radiotherapy is proposed in this research. The population domain (range of the population) of proteins and the relationships among proteins are considered to increase prediction accuracy. Methods: This research uses modified extreme value theory (MEVT), which is used to estimate the population domain of proteins, and correlation coefficients and prediction intervals to overcome the lack of knowledge regarding relationships among proteins. Results: When the size of the training data set was 5 samples, the mean absolute percentage error rate (MAPE) was 31.6200%; MAPE fell to 13.5505% when the number of samples was increased to 30. The standard deviation (SD) of forecasting error fell from 3.0609% for 5 samples to 1.2415% for 30 samples. These results show that the proposed procedure yields accurate and stable results, and is suitable for use with small data sets. Conclusions: The results show that considering the relationships among proteins is necessary when predicting the outcome of radiotherapy. 1 Li DC, Hsu HC, Tsai TI, Lu TJ, Hu SC. A new method to help diagnose cancers for small sample size. Expert Syst Appl 2007; 33: 420-424. 2 Li DC, Wu CS, Tsai TI, Lina YS. Using megatrend-diffusion and artificial samples in small data set learning for early flexible manufacturing system scheduling knowledge. Comput Oper Res 2007; 34: 966-982. 3 Chao GY, Tsai TI, Lu TJ, Hsu HC, Bao BY, Wu WY, Lin MT, Lu TL. A new approach to prediction of radiotherapy of bladder cancer cells in small dataset analysis. Expert Syst Appl 2011; 38: 7963-7969. 4 Huang CF. Principle of information diffusion. Fuzzy Set Syst 1997; 91: 69-90. 5 Huang CF, Moraga C. A diffusion-neural-network for learning from small samples. Int J Approx Reason 2004; 35: 137-161. 6 Li DC, Chen CC, Chang CJ, Chen WC. Employing box-and whisker plots for learning more knowledge in TFT-LCD pilot runs. Int J Prod Res 2012; 50: 1539-1553. 7 Lin YS, Tsai TI. Using virtual data effects to stabilize pilot run neural network modeling. J Grey SystUK 2014; 26: 84-94. 8 Williamson MP, Elder PA, Shaw ME, Devlin J, Knowles MA. P16 (CDKN2) is a major deletion target at 9p21 in bladder cancer. Hum Mol Genet 1995; 4: 1569-1577. 9 Pollack A, Czerniak B, Zagars GK, Hu SX, Wu CS, Dinney CP, Chyle V, Benedict WF. Retinoblastoma protein expression and radiation response in muscle-invasive bladder cancer. Int J Radiat Oncol 1997; 39: 687-695. 10 Kubo A, Nakagawa K, Varma RK, Conrad NK, Cheng JQ, Lee WC, Testa JR, Johnson BE, Kaye FJ, Kelley MJ. The p16 status of tumor cell lines identifies small molecule inhibitors specific for cyclindependent kinase 4. Clin Cancer Res 1999; 5: 4279-4286. 11 Tut VM, Braithwaite KL, Angus B, Neal DE, Lunec J, Mellon JK. Cyclin D1 expression in transitional cell carcinoma of the bladder: Correlation with p53, waf1, pRb and Ki67. Brit J Cancer 2001; 84: 270-275. 12 Nix P, Cawkwell L, Patmore H, Greenman J, Stafford N. Bcl-2 expression predicts radiotherapy failure in laryngeal cancer. Brit J Cancer 2005; 92: 2185-2189. 13 Colquhoun AJ, Sundar S, Rajjayabun PH, Griffiths TR, Symonds RP, Mellon JK. Epidermal growth factor receptor status predicts local response to radical radiotherapy in muscle-invasive bladder cancer. Clin Oncol-UK 2006; 18: 702-709. 14 Gonzalez-Campora R, Davalos-Casanova G, Beato-Moreno A, Garcia-Escudero A, Pareja Megia MJ, Montironi R, Lopez-Beltran A. BCL-2, TP53 and BAX protein expression in superficial urothelial bladder carcinoma. Cancer Lett 2007; 250: 292-299. 15 Jenkinson AF. The frequency distribution of the annual maximum (or minimum) values of meteorological events. Q J Roy Meteor Soc 1955; 81: 158-172. 16 Lowery MD, Nash JE. A comparison of methods of fitting the double exponential distribution. J Hydrol 1970; 10: 259-275. 17 Chawla NV, Bowyer KW, Hall LO, Kegelmeyer WP. SMOTE: Synthetic Minority Over-sampling Technique. J Artif Intell Res 2002; 16: 321-357. 18 Li DC, Huang WT, Chen CC, Chang CJ. Employing virtual samples to build early high-dimensional manufacturing models. Int J Prod Res 2013; 51: 3206-3224. 19 Tsai TI, Li DC. Approximate modeling for high order non.-linear functions using small sample sets. Expert Syst Appl 2008; 34: 564-569. 20 Li DC, Chen CC, Chen WC, Chang CJ. Employing dependent virtual samples to obtain more manufacturing information in pilot runs. Int J Prod Res 2012; 50: 6886-6903. 21 Li DC, Chen LS, Lin YS. Using functional virtual population as assistance to learn scheduling knowledge in dynamic manufacturing environments. Int J Prod Res 2003; 41: 4011-4024. 22 Li DC, Wu CS, Tsai TI, Chang FM. Using megafuzzification and data trend estimation in small data set learning for early FMS scheduling knowledge. Comput Oper Res 2006; 33: 1857-1869.